I really love discovering new hot tea blends and hot tea recipes! Not only is hot tea good for our health, hot tea recipes are often simply delicious. 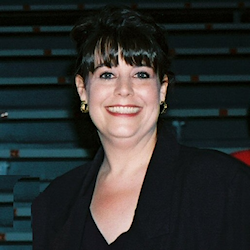 January is National Hot Tea Month, but long before January, I need my hot tea. After all, November and December are very cold months and we are constantly looking for something to warm us up inside and out. Truthfully, most tea-lovers drink hot tea year round. We don't wait for the cold weather, but hot tea is essential when freezing temperatures settle in for the fall and winter months. 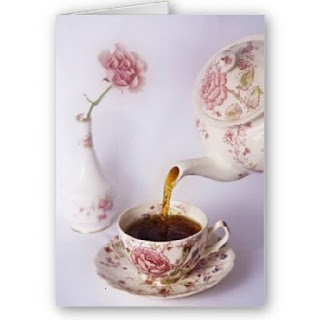 There are many great hot tea blends and hot tea recipes. It is often hard to choose a favorite hot tea, so we simply must sample them all! Hot tea is especially delicious when shared with loved ones. What is the Difference in Teas? Green, Black, and Oolong tea are all made from the same tea leaves. It is the actual processing of the tea leaves that makes the difference. Green teas ~ The leaves are steamed before they start to ferment. Tea leaves are not allowed to ferment for Green teas. Black teas ~ The leaves are fermented for a limited time and then heated to stop further fermentation. Oolong teas ~ The leaves are partially fermented. Herbal teas ~ Not actually made from tea leaves. Even though they are called tea, herbal teas are not made from tea leaves. They are drinks created with flower leaves, peels, spices and/or herbs. According to the Tea Association of the United States, "recent research findings have reported that drinking black tea may improve the body's defenses and quicken the response to bacteria and viruses." This is just awesome news and an excellent reason to raise our tea cups and toast tea! Black tea is considered the tea choice for energy. If you need a boost in your energy level, this is the tea choice for you. Green tea is considered to be healthiest tea. It is lower in caffeine and contains antioxidants that promote better health. Some studies show that it may even help prevent cancer, heart disease and tooth decay. Green tea also helps to increase your metabolism, which can result in slight weight loss and it helps lower cholesterol. Oolong Tea is often referred to as the "weight loss tea" and it has been said that it is the most effective tea in aiding weight loss. Some report that it aids in the relief of eczema, diabetes and allergies. Oolong tea is my personal favorite. I've never tried any Oolong blend recipes. I simply stick to the standard Bigelow teabag and add a teaspoon of sugar for taste. I don't drink Oolong tea for weight loss. Honestly, if it affects my weight, I wouldn't know it. I have been drinking it for decades. 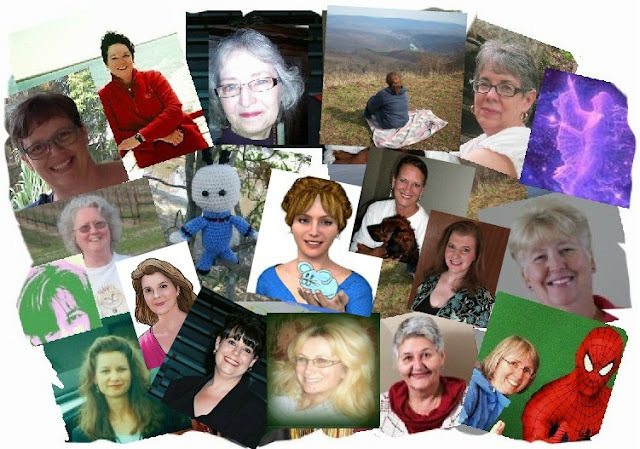 From Halloween to New Years, we are celebrating, chatting, sipping tea and visiting with friends and family. It is wonderful to have a variety of hot tea recipes to serve and to share. 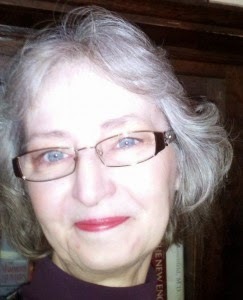 I am not the only hot tea loving Contributor! 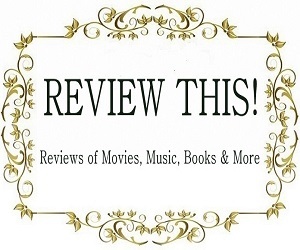 Here are a few more articles that you can read right here on Review This! There are lots of great options available from a selection of teas to strainers, mugs, tea pots and much, much more. 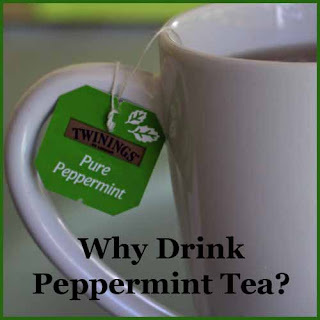 Why drink peppermint tea? As well as being delicious this tea has a myriad of health benefits. Looking for good medicinal teas? You can't do much better than Lifestyle Awareness teas. Here's my review after trying them. 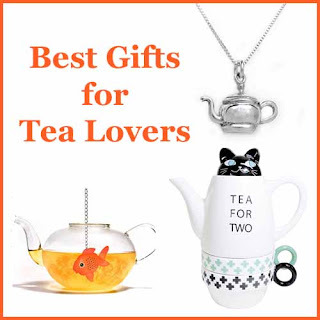 Let's review some of the best gifts for tea lovers, I've been given a few of these gifts myself as one of my aunts affectionately calls me 'an old tea bag'! I've been drinking and enjoying tea for many decades and even though I enjoy my coffee if I have to make a choice tea is still hands down my favorite. 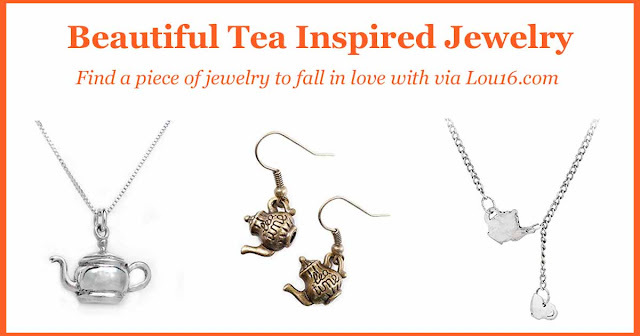 What to give a tea lover? Well there's lots of great options available from a selection of teas to strainers, mugs, tea pots and much, much more. 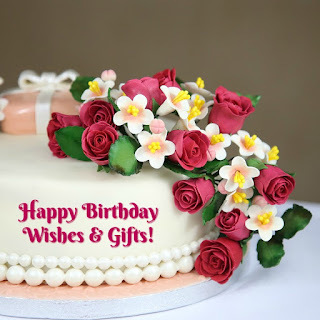 Let's have a look at a few things that I'd like to see gift wrapped for me! Cute, Fun, Unique, Retro & Anything BUT Boring Tea Infusers! There are so many different tea infusers available to purchase from cute tea infusers, to fun ones, cool retro tea infusers and more - one thing these tea infusers have in common is that they're unique and are perfect gift ideas. These tea infusers are a couple of my favorite tea inspired gifts that I've received and they put a smile on my face every time I use them. 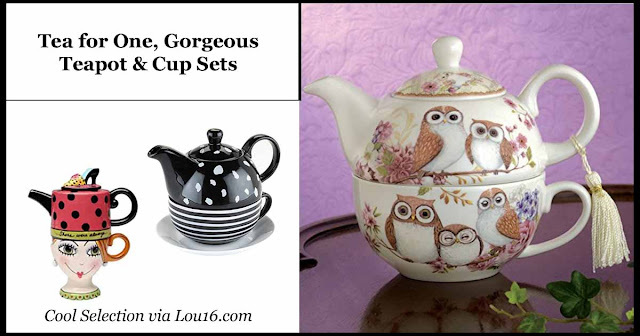 Of course you can't go past a tea pot as a gift idea for a tea drinker and there's an awesome selection available. The great thing about a tea pot is that you can use it with tea bags or loose tea so it doesn't matter what their preference is. Isn't it adorable? Even a dog owner like myself would still fall in love with the black cat's face! In my household both my hubby and I enjoy drinking tea, but I do like to experiment with different teas whereas he sticks with his standard cuppa. In cases where people are single, or the sole tea drinker in the house, or likes to try different teas then a stackable tea for one tea set is an awesome gift idea. As you can see teapots can be found in a range of different styles, personally I like what I think of as a traditional teapot (The Pioneer Woman one featured below), but I know that a lot of people associate teapots and tea parties with the style of the porcelain butterfly & dragonfly teapot style above. With more and more people being inspired by different teas and infusions the blue floral teapot featured makes me think of an Asian influence, perfect for a Japanese tea ceremony. I deliberately haven't included any clear, glass teapots in this selection even though they do appear to be quite a popular choice these days. If you're a tea drinker you'll be aware of how much the tannin in tea can stain your cup/mug/pot which is why I'm not sure how long the glass ones will stay looking as nice as they do. Despite this I was given a clear tea pot as a gift so I will be trying it out for myself and will report back with a review at a later date. If the clear pots can be kept looking nice then there are a couple of different gifts that feature them including teapots that dispense the tea from the bottom and 'flowering' tea pots. Stay tuned for more on these after I've investigated more! As I've said other options can include a selection of teas or a mug. When it comes to mugs there are some great personalized mugs available. An alternative to a personalized mug is the mugs that come complete with a strainer that sits inside them and a lid - I received one of these from a work colleague a few years ago and it's fantastic! 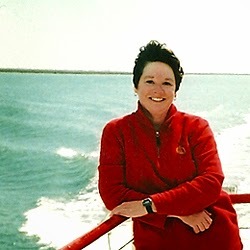 I hope I've given you a few gift ideas for the tea lover in your life & maybe even a few things you'd like for yourself. Today I'm going to review a great infuser and mug gift set I was given. I'm not sure why everyone keeps giving me tea related gifts, I don't drink that much tea do I?! 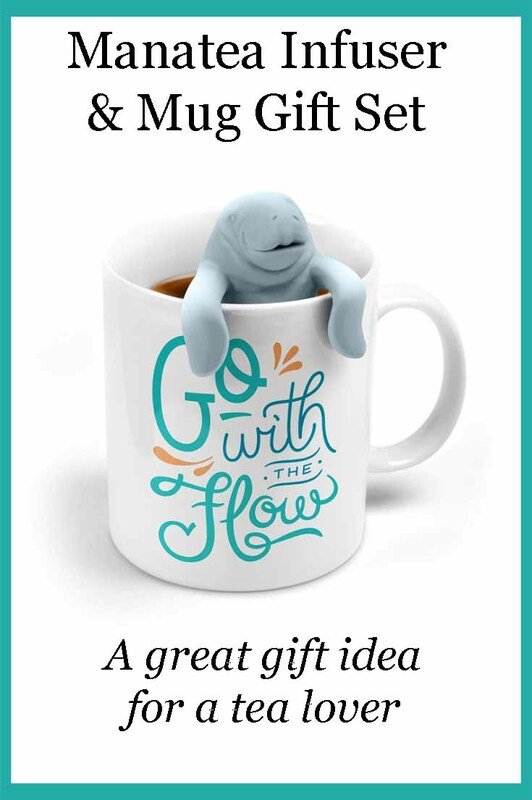 The Manatea Tea Infuser and Mug Gift Set is really cute - I love the casual look of the mug and the 'go with the flow' inscription is very appropriate for me. Don't even get me started on how cute the manatea infuser is! 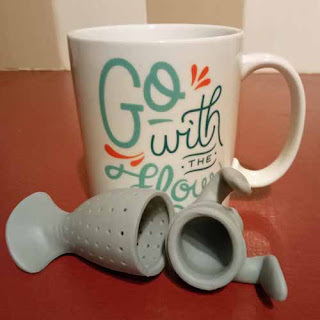 The tea infuser is made from food grade silicone which means it's soft and pliable - very easy to handle. 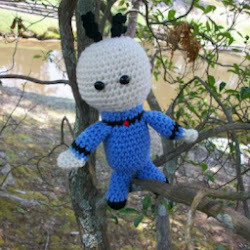 You can see how cute it is below, a real conversation piece. You can see in the first image that the 'infuser' part of the tea infuser is basically the manatea's body. I do love cute tea infusers as they are a great way to brighten up my day - my rubber ducky tea infuser always brings a smile to my face. I think this manatea is going to make me smile when I look at it too! Now, what about the practical aspect of the infuser? As I said the silicone is very easy to handle and the tea infuser comes apart and fits together again very easily. There have been some criticisms of this tea infuser so I'm going to address them here. You can't fill the infuser very easily because of it's size. Now I don't know what size teaspoon this reviewer had because I found it very easy to fill - I only added one teaspoon of tea because that's all I use for one mug, but it would have taken two very easily. 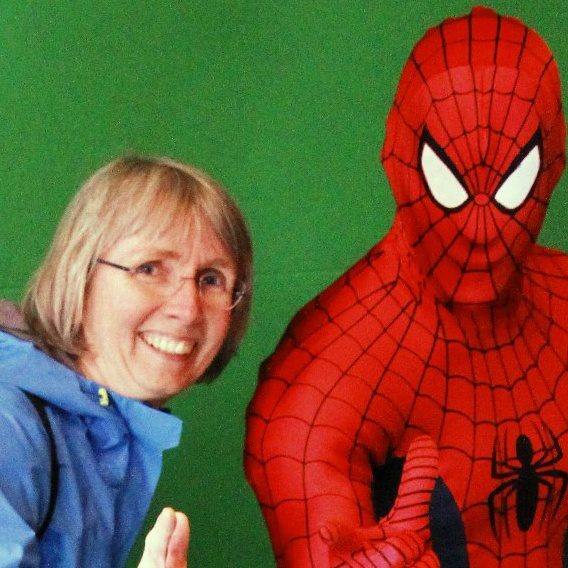 I've added a photo here so that you can see how easily my (normal sized!) teaspoon can fit into the infuser. You can't drink the tea while the infuser is on the mug. Well I have to disagree with this reviewer as well - to a degree anyways. I wear glasses and thought there could be a problem, however I found drinking most my tea from this mug with the infuser attached was fine. When it got to the bottom part of the mug (from where the non-infuser part of the tail part was) the manatea did touch my nose, but I didn't think it was anything to worry about. I also would like to note that I didn't get any tea leaves left in my mug after drinking although I should add that I haven't drunk any really fine leafed teas. 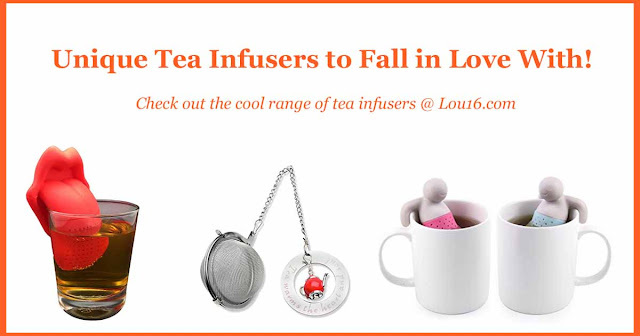 I would thoroughly recommend this and I don't think you can ever have too many tea infusers! Want to check out more gift ideas for tea drinkers? 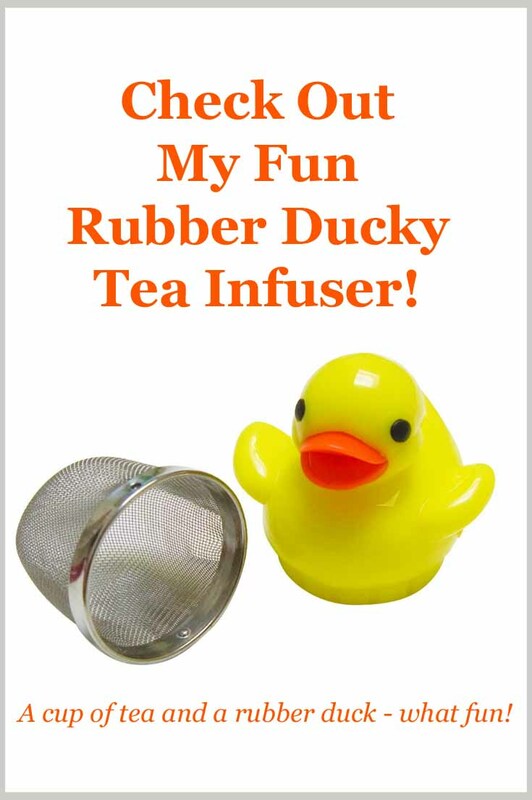 If you're after a bit of fun with your cup of tea then you will love to read my rubber ducky tea infuser review. I absolutely love this fun tea infuser, because let's face it what's not to love about a rubber ducky? As I review Twinings Peppermint Tea Bags let me also answer the question 'why drink peppermint tea?' - you might be surprised at the range of benefits this delicious beverage has. Last time I shopped for tea, I noticed a new brand on the shelf: Lifestyle Awareness Teas. 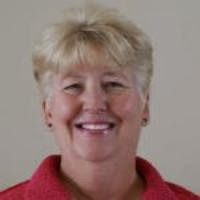 I noticed they were organic and that they appeared to support specific aspects of health. As someone who loves their cuppa I think the idea of tea Christmas ornaments on my Christmas tree is an absolutely fantastic idea. Whichever tea you prefer there is just something about a tea inspired Christmas tree that I think is perfect. I will admit to a bias - I love, love, love peppermint tea, but who wouldn't? 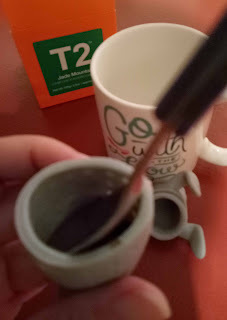 I touched very briefly on why I enjoy peppermint tea on my fun tea infuser review as I usually enjoy fresh peppermint leaves steeped in boiling water. Sometimes, however you need another source and my go to commercial brand is Twinings Pure Peppermint tea bags. When you're unable to use fresh leaves for whatever reason then tea bags are a great idea, but I've also just discovered (thanks to Amazon) that you can buy Twinings peppermint tea in K-Cups as well which I know a lot of people use. 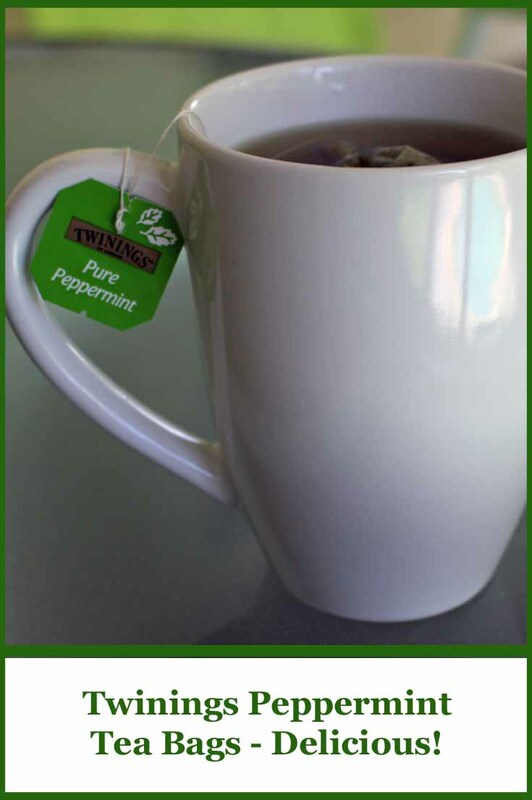 Why Do I Recommend Twinings Peppermint Tea Bags? 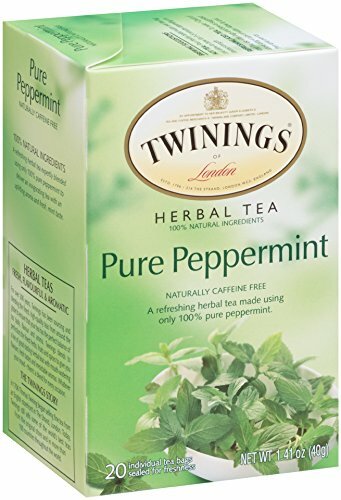 Twinings Pure Peppermint is a tea that I really enjoy and I first came across it a few years ago when I managed to kill my peppermint plant - apparently they can't be killed, but as I've said to my daughter on numerous occasions there's no such word as can't! I had to find a replacement as I'd come to really enjoy my cup of peppermint tea after lunch so I set off on a mission to find some peppermint tea bags. Once I sat down to my first cup I was very happy that I had decided on this brand as it really is delicious. I work a few days a week in an office so I leave a few peppermint tea bags there so that I don't have to miss out on my peppermint tea when I don't have my plant handy (although making my own is my still my favorite way of enjoying this beverage). The main reason I enjoy drinking peppermint tea is because it's delicious and I love the taste! There are lots of health benefits for drinking it as well, though and it's always nice when something that is good for you also tastes delicious! Aids digestion, including bloating, cramping, vomiting & nausea - even motion sickness can be helped with peppermint tea. Boosts your immune system - it has known anti-bacterial properties which means it can help ease symptoms of illness (especially colds, flus and sinus problems) and it can also act as a preventative. Helps bad breath - it doesn't just make your mouth feel fresh and smell clean from the menthol (that's what gives you the minty flavor), but because of the anti-bacterial properties it can kill off germs that cause haliotis. 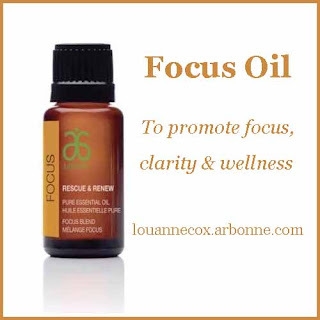 Helps with concentration - more on that below! Can provide stress relief - menthol (an active ingredient in peppermint tea) has natural sedative and anti-spasmodic properties which combined together really helps to ease stress while the anti-inflammatory properties can help to lower blood pressure allowing you to relax. Helps with headaches and migraines - because of how it helps with stress and sinus (two causes of headaches) peppermint tea can be very helpful. Offers sinus relief - menthol is a natural decongestant which means it provides relief from sinus pressure, it also soothes a sore throat which is handy if the sinus congestion is from a cold or flu. I've seen it recommended to add honey to peppermint tea for sinus, colds and flus, but I've never added honey myself. There are lots more health benefits, it's almost sounding like a superfood isn't it? I should add however that when taking herbal infusions for a medical reason you should always talk to your doctor. Menthol has been known to cause typically mild allergic reactions in some people so if in doubt consult a medical professional. I always enjoy my peppermint tea after eating my lunch (I sometimes enjoy it at other times, but this is my favorite time). As I've said I enjoy the flavor, it leaves my mouth feeling lovely and fresh and I also think it helps with my digestion. I have also discovered that I concentrate better in the afternoon if I've had a peppermint tea after lunch - no more '3pm fog brain' for me. I had been wondering if this increased concentration was just a placebo effect, but apparently there have been scientific studies (and here was me thinking I'd 'discovered' this all by myself!). A study published in the International Journal of Neuroscience found that peppermint tea can increase focus and concentration. Another study by the University of Cincinnati found that the scent of peppermint was even better at boosting alertness, concentration and improving memory than actually drinking the tea. Now I'm not going to just sniff the tea and not drink it, but I take the study to mean - sit down, relax, cradle your cup/mug of precious peppermint tea and inhale the scent while also sipping slowly on it. Once it's finished you'll be set for a very productive afternoon! I received this cute rubber duck tea infuser for Christmas from my daughter a couple of years ago. I'd said I wanted a fun tea infuser and she wanted to know what I meant by that so I mentioned a rubber ducky one as an example. My mum was Christmas shopping with her and told me (after the event) that she was searching high and low for it ignoring other fun tea infusers like the sloth tea infuser or the geeky space capsule tea infuser for examples. 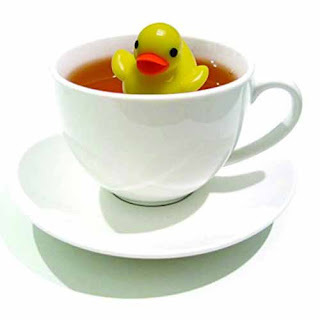 Aside from looking cute floating in a mug of tea instead of someone's bath this rubber ducky hides a mesh tea infuser underneath which you simply add the loose tea to, attach the rubber duck and let it float around dispensing flavor to your hot water. Tea Ducky Tea Infuser - A Fun Way to Enjoy Tea! Personally I only use my rubber ducky tea infuser for making my own peppermint tea. I simply pick fresh mint leaves, pop them in the mesh and leave it to brew for about 5 minutes before enjoying a lovely tasting aid to digestion. The peppermint tea really sets me up for the afternoon as it not only tastes nice, but stops indigestion and also helps to keep me refreshed and invigorated, but back to the tea infuser. This fun tea infuser comes with a blue stand which looks rather like an egg cup, with a wavy 'top' and lets you simply lift rubber ducky out of your cup and into the stand when you want to drink. Once washed and in the cupboard it lets you sit the tea infuser neatly until use. If you're a loose tea drinker, or you just want to try some of your own herbal infusions then I recommend this rubber ducky tea infuser as I dare you not to smile when you see it's cute face! 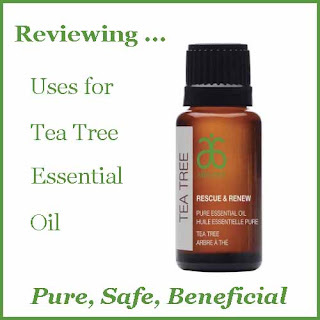 I was first introduced to Tea Tree oil over 20 years ago and absolutely love it. At the time that I was introduced to it I was managing a health food store in New Zealand and the brand I used was Thursday Plantation. Thursday Plantation was the first company to make tea tree oil commercially, but over the years many other companies have followed suit. 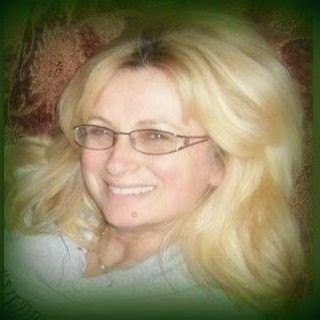 I was really excited when Arbonne released their new products for the year and tea tree oil was one of them. 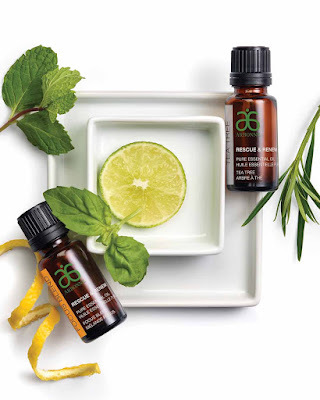 As a company I love the ethics of Arbonne, the fact that all of their products are of high quality, PETA approved, vegan and so much more means that I will be using their tea tree oil. Over the years I have used tea tree oil in many ways, from household uses to medicinal uses and there are lots of other uses that I haven't tried. Tea Tree oil has antiseptic properties and is both a germicide and a fungicide, in fact according to Valerie Ann Worwood (The Fragrant Pharmacy) it's antiseptic properties are thought to be 100 x more powerful than carbolic acid. I have used it in a diffuser or burner when I've been sick (although to be honest I prefer lemon oil as it doesn't make the house smell like a hospital!). My husband used to get a recurring fungal infection on his toe nail and was constantly using a cream from the doctor which would help it, but it would never go away completely. 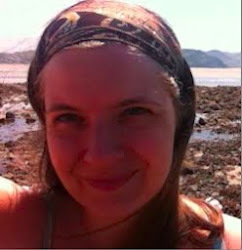 I decided that we should use tea tree oil (much to the dismay of my sceptical husband!) I put one drop of tea tree oil onto a dampened cotton bud and wiped it over the nail twice a day. Much to my husband's disbelief it actually worked and the fungal nail infection went away completely. The owner of the health food store I managed used to get dandruff and he found that once he used a tea tree shampoo and conditioner it cleared up. Well to be honest I didn't think my husband would like the smell of the shampoo and conditioner and I already had the oil so I told him to put the shampoo onto his hand and then add one drop of tea tree oil, mixed it together and then use it on his head. Lo and behold his dandruff disappeared. It's amazing how over the years my husband has been much less of a sceptic! 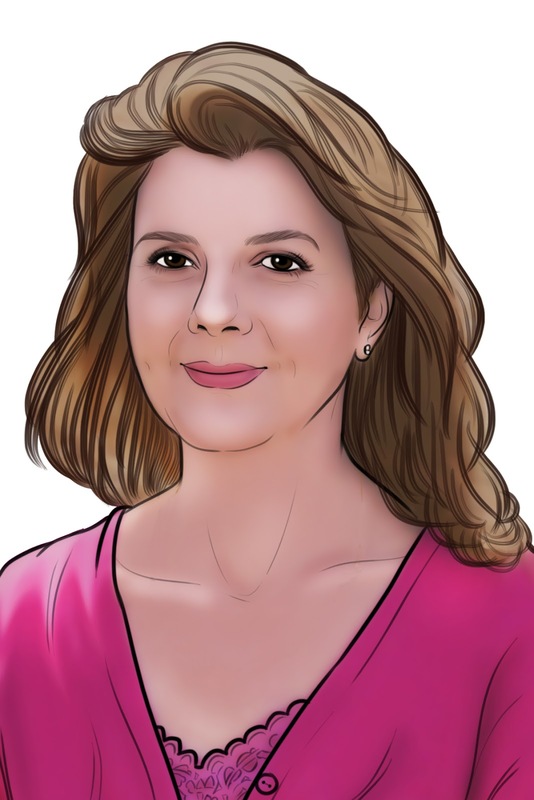 When I worked at the health food shop there were a few products for acne that were based on tea tree oil that were very successful for our customers, but I heard of a couple of cool ideas on a training I recently attended. Use this on your skin in place of a toner. I think this is awesome as I know a couple of years ago I worked with a young lady and she used straight witch hazel to clear up her problem skin, coupled with my previous customer's experience with tea tree I think this is a winning combination. If you have blemishes anywhere on your body you could add a couple of drops to coconut oil or jojoba oil and apply to your skin. You can add 1-2 drops to your existing masks, scrubs or face creams. The only thing you can NOT do is add it straight onto your skin. This is a pure essential oil which means it's highly concentrated and should always be diluted before using. Of course you can always add hot water to a bowl with 2-3 drops of Tea Tree oil and then pop a towel over your head and the bowl and let the combination of steam and tea tree work it's magic. As a disclaimer although I remember my friends steaming their face as an 'acne cure' as a teen I didn't suffer from acne so I'm not sure if it worked. My daughter tried it a couple of times, but didn't like the smell as it reminded her that I used tea tree on her when she had nits! (I can't remember the ratio I used for that). As she wouldn't give it a chance it didn't work. My favorite way to use tea tree oil around the house was in the toilet! I would lift the cistern up and pop a dozen drops of tea tree oil to the water in there. Every time you flush you get a very faint odour of the tea tree oil, when I couldn't smell it anymore (or a week had passed) I would add more drops. Now I wasn't doing it for that fragrance by the way, I did it because it really helped to keep the toilet bowl cleaner. I haven't done this in a while because with our last toilet I couldn't easily access the cistern, but with our newer toilet and Arbonne releasing their tea tree oil I will start this again! I have also used tea tree oil for removing scuff marks off of lino floors (add a drop to a damp cloth and wipe). Talking of floors you can also add 1 tsp of tea tree oil to 1 1/5 gallons of water and use that to wash your floors. My husband's response was that it smelt like a hospital, so the next time I also added a couple of drops of lavender to try and mask the smell. I no longer do this because my husband really didn't like the smell and sometimes you just accept defeat in some areas! If you like the smell of tea tree oil you can also add it to your vacuum bag when vacuuming - I tended to only use lavender essential oil (see above re husband's complaint! ), but I now have a bagless vacuum so I don't get the lovely smell as I'm cleaning the house! Now dog's have very sensitive skin so do NOT put tea tree oil directly onto a dog's skin, but it can help if they have sores or are itchy, it just must be diluted. If your dog is itching a bit then simply pop 1 drop into the shampoo before washing him/her. My late dog got a nasty sore on his tummy so I diluted a drop of tea tree oil in a natural base cream (I can't remember the name of it) and rubbed that on it. It worked really well. For my current dog I've always used pawpaw ointment (no need to mix anything). Have You Used Tea Tree Oil? There are lots of uses for tea tree oil which I haven't even touched on, I'd love to know if you've used it and what your experiences of it have been. I am absent-minded. I make a lot of tea. As I start each day I put the water on to boil for my morning pot of tea. Then I go to my office to check my email or Twitter. I always mean to take my digital timer with me, but even when I remember to take it, I sometimes forget to set it. 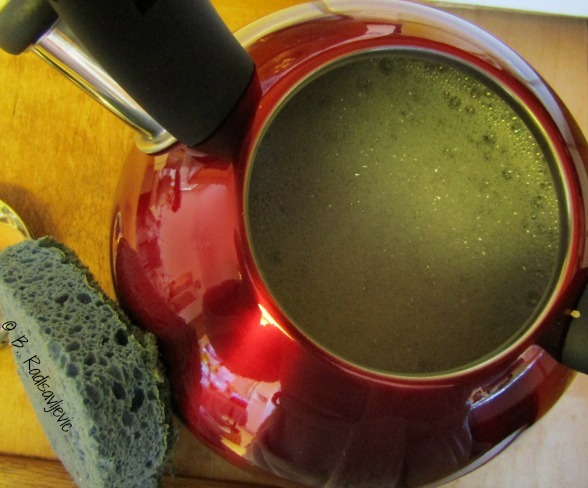 My old stainless steel tea kettle had no whistle. You can probably guess what happened. Yes! I forgot all about the water. Hubby wasn't home. A couple of hours later I finally went to the kitchen to get something, but it was too late. The kettle was not only dry, but the bottom was black inside and out. I knew the pot was beyond hope. I should have learned after letting the kettle burn dry a couple of other times that I should not leave the kitchen when the kettle is on. I was able to salvage the pot before because it was dry but not yet black. This time I knew I needed a new tea kettle -- one with a loud whistle. 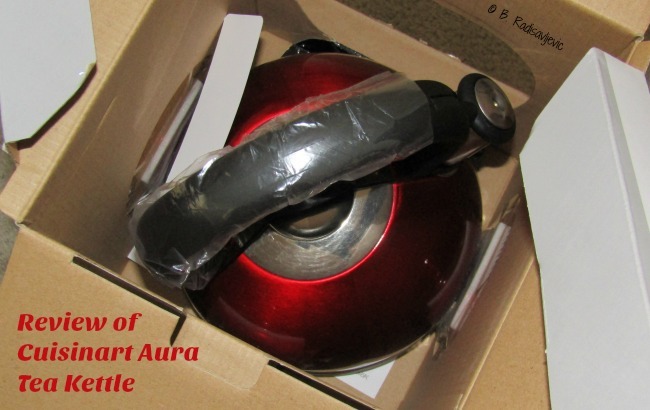 Before I ordered the Aura Tea Kettle, I read so many reviews of stainless steel tea kettles my head was swimming. Not a one of them had all five-star ratings. 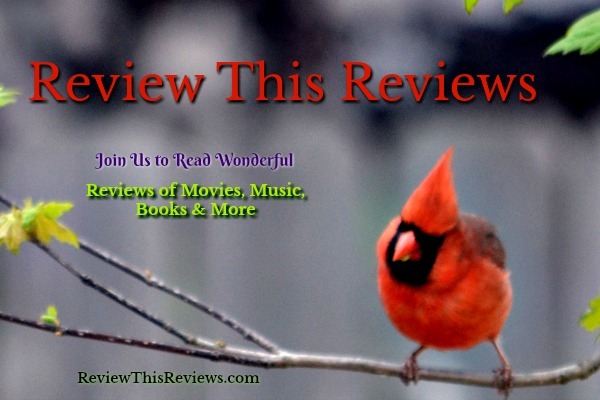 But this one had a four-star rating out of over a hundred reviews, and as I looked before I started writing today there were 151 reviews. 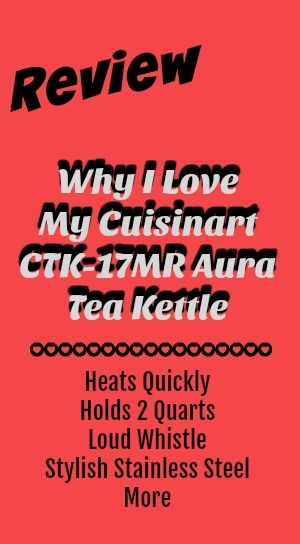 I needed a kettle that would heat at least two quarts quickly. It had to be heavy enough to take a bit of abuse. I had to be able to fill it easily from the reverse osmosis faucet. The handle had to stay cool when the kettle was hot. The top had to be easy to remove and the kettle had to work on my glass-top electric stove. 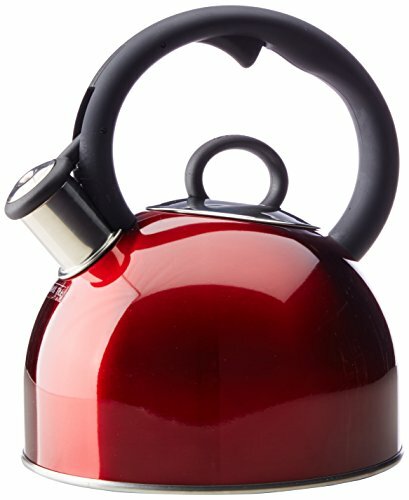 In addition, I wanted the tea kettle to look happy in my kitchen and be reasonably priced.This model comes in many colors, and I picked the red tea kettle because it looked best in my kitchen. Most important, of course, the tea kettle had to have a whistle loud enough to hear from my computer room. After unpacking my new tea kettle, I read the directions and followed them. Wash with warm soapy water and rinse before first use. Don't fill past the fill line. Use a medium high setting on the stove. After the kettle reaches a full boil, let it sit for 20 seconds before pouring. I have now had my tea kettle for six months. The finish is still shiny. There is no sign of rust on the inside or outside. No plastic has melted from the handle or spout lid. I have followed the directions to use only medium high heat, so I have used a seven setting on my stove instead of the highest setting that I used with my old kettle. I have found that a full kettle heats in about ten minutes. I'm wondering if those who gave this tea kettle bad reviews followed the directions. The one thing I would change would be to put the fill line where it is visible from the inside of the kettle when I'm filling it. It's under the spout on the outside. I now know where that line would be if it were on the inside, and I've had no problems. I just think it would be more convenient to have the fill line on the inside under the spout instead of on the outside. The whistle is very loud, but I can still get distracted if I'm on the computer. For this reason I also take a portable timer set for ten minutes with me into my computer room. When the timer goes off or the whistle screams at me, I head back to the kitchen. I let the boiling water sit for 20 seconds, as per directions, and then pour it into a large teapot. After it steeps for five minutes I'm ready for that first cup of morning tea. I highly recommend this tea kettle. The timer also helps keep me focused. 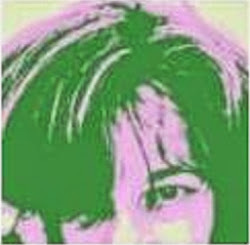 When I'm concentrating on writing I can forget almost anything unless it's ringing on my desk a foot from my ears. 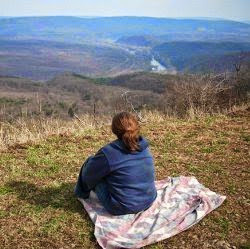 If I step away from my desk, I will hear the whistle from wherever I go and head for the kitchen. If you need a new tea kettle or want to get one as a gift, I believe you should consider this one. And while you're at it, get the timer, too. 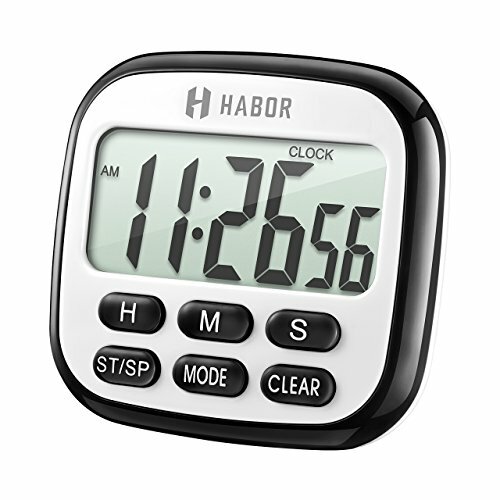 You will find lots of uses for it since you can set it for hours, minutes, and seconds. 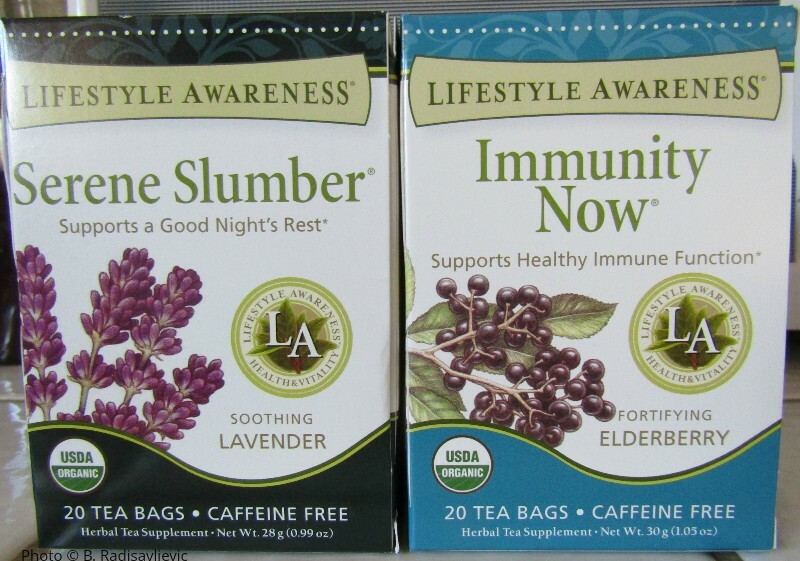 Last time I shopped for tea, I noticed a new brand on the shelf: Lifestyle Awareness Teas. 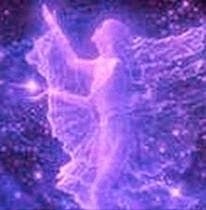 I noticed they were organic and that they appeared to support specific aspects of health. I also noticed the introductory pricing that made trying a new brand seem less risky. Since it was the beginning of a new year and flu season was well underway, I decided to purchase two of the teas: Immunity Now and Serene Slumber. I have to admit that the artwork on the packages helped sell me on these teas. 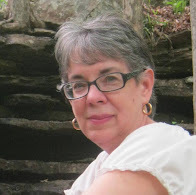 I had just finished reading Elderberry Croft: Complete Collection. 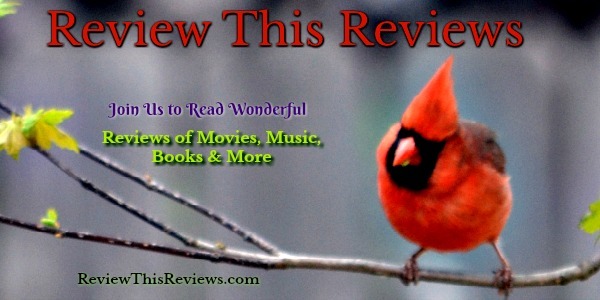 (Read my review of it here.) This novel of healing hurting souls spoke often of the virtues of elderberries, and especially elderberry tea. Although I have an elderberry tree, I've never taken the trouble to find out how to capture its healing powers by learning to make the teas and syrups talked about in the book. 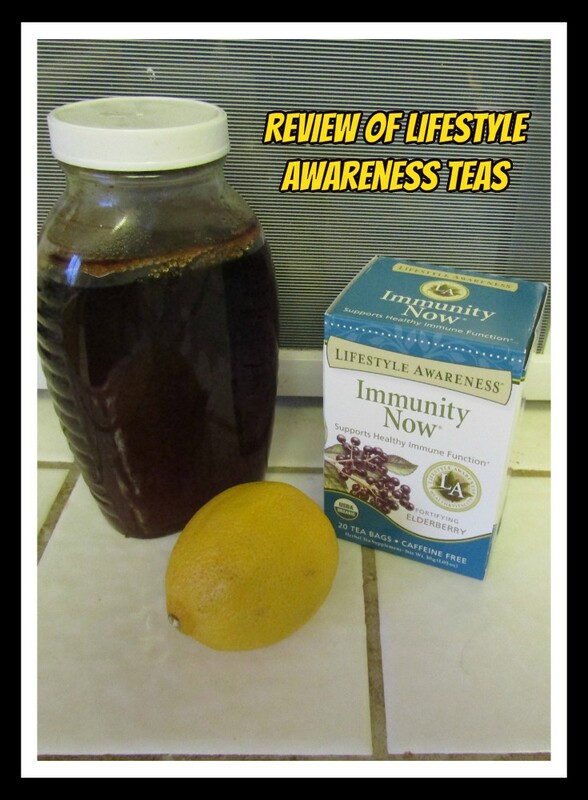 When I saw Immunity Now on the shelf, I decided it was time for me to try elderberry tea the way Willow served it to her friends -- with honey and lemon juice. 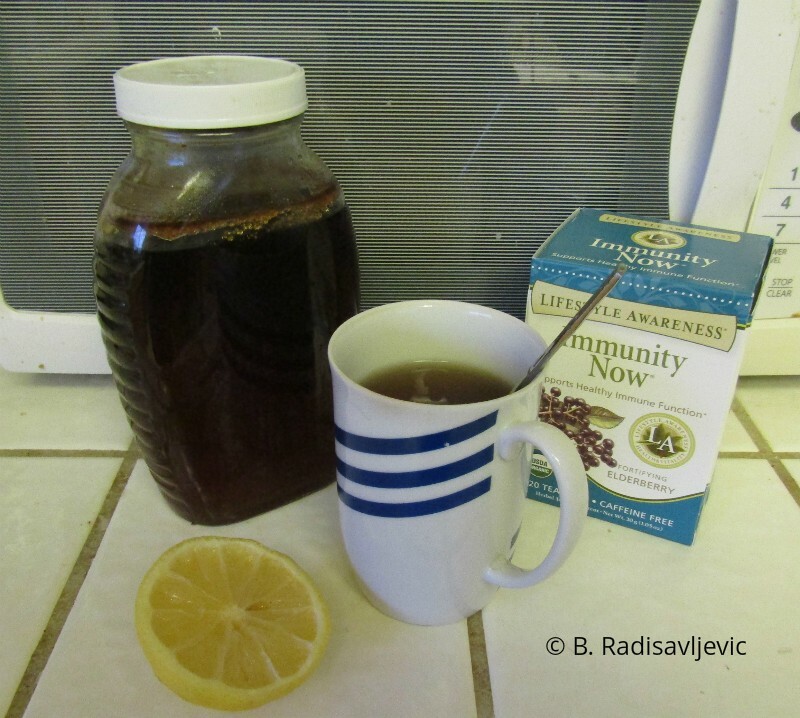 About a week after I bought Immunity Now tea, my husband came down with the flu. Although we take supplements that support the immune system year round, when you have the flu, your immune system needs all the help it can get. I decided it was time to make a pot of the Immunity Now tea. I used a small, three cup pot. All Life Awareness teas are best made with boiling water steeped in a covered pot or mug to keep all the goodness of the herbs intact. I'm lazy, especially when I don't feel good. I'd rather make one larger pot of tea and reheat when I need more than to make tea cup by cup as needed. It works for me. Of course, if you want to keep switching your variety of tea, a single covered cup or mug may work better. Find some of each below. Tea price shown is for a multipack of six boxes. That's the deal I chose when I reordered after trying my first package of this tea. I found Amazon's price lower than the regular store price. 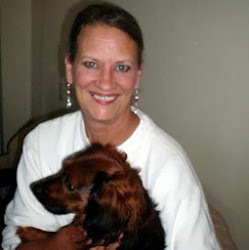 I started drinking Immunity Now the minute I knew Hubby had the flu. (Of course, I gave him some, too.) I don't usually sweeten my tea, but I knew that honey and lemon juice are helpful when one has a cough, so I added them to my tea. It so happened that I had a jar of raw organic honey left from the days when my husband kept bees, so I used that. Adding the honey and lemon juice made the tea much tastier than I expected. It was also soothing. I kept drinking it after I got the flu myself. It made me feel better, though I have to admit it didn't seem to discourage my flu too much. I'm quite sure, though, it was a beneficial hot fluid that kept me more comfortable. I have a terrible time getting sleepy at night. Even though I was tired and sick, I knew I would need some help relaxing enough to get to sleep. I made myself a pot of Serene Slumber. 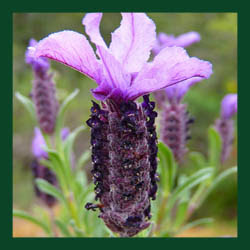 It has a number herbs that support a good night's sleep, including lavender, avena, rosepetals, chamomile, and catnip. After the tea had brewed, one sniff made me sleepy. I drank a cup, went to bed, and slept. I'm going to add this to my bedtime routine. Lifestyle Awareness teas are medicinal. For this reason, you should pay attention to recommended dosages, or the number of cups to drink a day. The manufacturer recommends, for example, five or six cups of Immunity Now per day. Before you take a medicinal tea, you should check with your doctor if you have a medical condition or take prescription drugs. Medicinal herbs can interact with prescription drugs, just as those drugs can sometimes interact with each other. Although drinking a medicinal tea may work with your body to make you more comfortable, these products are not intended to prevent, cure, or treat any disease. These teas have not been evaluated by the FDA. Lifestyle Awareness Teas are certified organic by the USDA. They are also Fair Trade, Kosher, gluten-free, and vegan. The tea bags are manufactured using totally chlorine-free methods. Packaging is also environmentally friendly and recyclable. See all Lifestyle Awareness Tea varieties here. I think everyone should have a little aromatherapy in their life and it can be enjoyed in so many different ways. You can use essential oils as air freshner or in cleaners around the home. You can diffuse them or use them in massage oils. You can also add them to your skincare and so much more. Let's have a look at just how you can add them into your life easily, safely and get maximum enjoyment all at the same time. 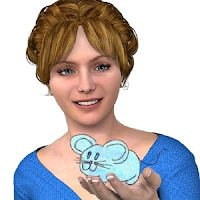 First you have to think of ways that you would enjoy using them and get an oil that can multi task for you. I always think that tea tree, lemon and lavender oils are good ones to start with because they can be used in so many different ways. Once you are used to using essential oils regularly you can start to expand your aromatherapy collection and venture into oils such as Roman chamomile, jasmine, lime, geranium and rosemary to name a few that I love. 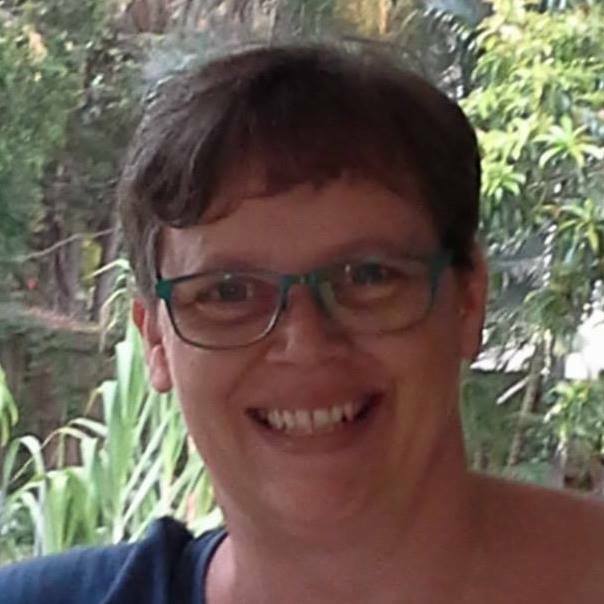 For anyone getting started with essential oils I highly recommend joining this facebook group - Using & Enjoying Essential Oils with Louanne - as a disclaimer it's one I've just started myself! The most common use of essential oils in the home seems to be as an air freshner. I use a difuser that I plug in (I used to use an oil burner that you would use tea light candles in, but I worry about fires these days!). If you don't want to invest in a difuser in case you don't use it then rice is your friend. You know the little 'bowls' of pot pourri people have around the place, well you can add uncooked rice to a small container and then add a few drops of essential oils and you have the same fragrance carrier. It should go without saying that you must not cook the rice once you've used it like this! I'm relatively new to this concept as I only heard about it a few months ago, but it works really well! If you have carpet you can also freshen up the smell in the room by creating your very own natural version of 'shake n vac'. All you need is baking soda and your favorite essential oil, I like lavender or one of the citrus oils. For each cup of baking soda you can add 5-7 drops of essential oils and shake it up really well (it can clump sometimes so I have heard it suggested that you use a whisk to mix it up before adding to a container ... I have never done that! I use an old carpet freshner (a generic shake n vac powder) container as it already has the holes for you to shake it out of - doesn't get any easier! While we're talking about carpets - do you have a bag in your vacuum or do you have a bagless one? I have a bagless vacuum at the moment, but when I had my old bagged vacuum cleaner I would put 2-3 drops of tea tree, lemon or lavender oil into the bag each time I emptied it, you could smell the fragrance every time you turned the vacuum on. There are lots of ways you can incorporate essential oils into your cleaning routine besides using it on your carpet. You can make your own multi purpose cleaner, window cleaner, use it in the toilet cistern and many more. I love using it in the toilet cistern and have been doing this for years - I add 6-10 drops of tea tree oil into the cistern and every time you flush the toilet you get a faint whiff of tea tree oil, when you stop getting that whiff (or once a week) you add 6-10 drops again. I am sure that it makes the toilet easier to clean as well, but I may be imagining that! Years ago where I worked had lino flooring and we would often get black marks left by people's shoes - we simply added a couple of drops of eucalyptus oil to a cloth and wiped it on the mark - gone! There are lots of recipes for cleaning products to be found online that use lemon or tea tree oils. 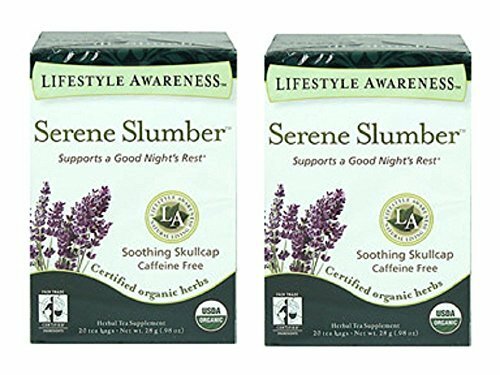 So many people have problems sleeping and this is something that aromatherapy can really help with from pillow sprays to having a diffuser in the bedroom. On my facebook group I have a great recipe for a pillow spray that you can use, but you can also just add a few drops of lavender and/or chamomile oil to a hankerchief and take that to bed with you. Using a diffuser is a great idea to help with sleeping. Many years ago I worked with a lady who's daughter used to get so stressed out at college that she couldn't sleep (she also suffered from asthma). 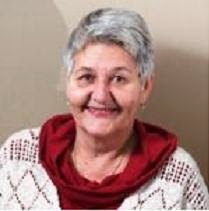 She brought her a diffuser and a relaxing oil blend and instructed her to use it at night - not only was she able to sleep better, her asthma also seemed to improve. Of course a lovely relaxing massage before going to bed is also a great way to help you sleep, you may have to take times with your partner as to who has the massage though! You can use essential oils to make your own beauty products or add them to your existing beauty products to enhance them. There's not enough time to go into all of the uses for these, but the more common ones you can use is to add a few drops of lavender oil to a hand cream, add a few drops of tea tree oil to a shampoo and to add a drop of rose oil to a face mask. 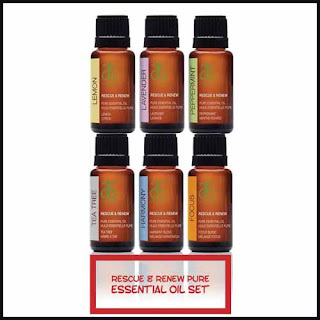 You could buy these essential oils one at a time or if you want to get started right away then we have a special set that is an economical way of getting the three must have essential oils to start along with another pillar essential oil and some blended essential oils. They are all sent to you in a box which is great because essential oils should be kept in a dark cool space ideally. Arbonne have just brought out their holiday range for 2018 and this year it includes a gorgeous essential oil set. 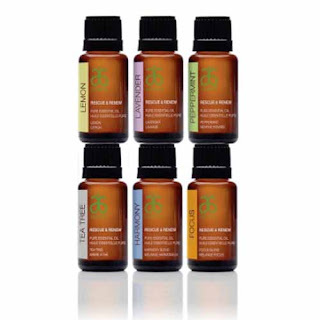 If you're interested in using essential oils then this is a great way to start your selection. 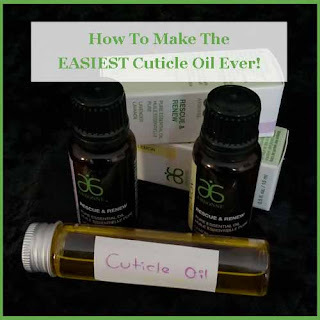 There are so many recipes for DIY cuticle oil that they would make your head spin, but many of them used so many ingredients that it just seem such an effort so when I found a simple recipe with only 3 ingredients .. 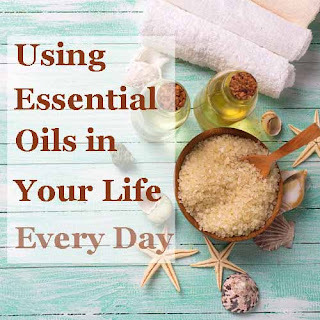 I thought it would be handy to showcase which aromatherapy oils are the best to help relieve stress and how you can incorporate them into your lifestyle to make stress a thing of the past. 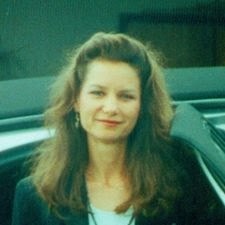 A facebook group where we can talk about essential oils and how to incorporate them into your life.